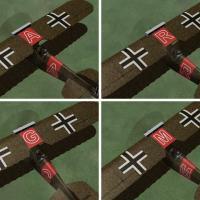 This is a complete set of letter decals for the Phönix D.IIa. You can assign them in the Loadout screen or the game will randomly assign a different one to each plane. This completely replaces the "D" folder and uses a new Decals.ini and Numbers.lst for the skins. I have also uploaded a new version of the Phönix which includes this decal set, so if you downloaded the Phönix D.IIa after September 20, 2011, you already have these decals. For FE1 - Unzip the file. In the FirstEagles/Objects/Aircraft/PhoenixD2a folder, delete the folder named "D" and replace it with the new one. Next, open the folder named "Texture1". Delete the file named "Decals.ini" and move both the new Decals.ini and Numbers.lst into the folder. Do not delete any other files from the Texture1 folder. For FE2 - Unzip the file. In the FirstEagles/Objects/Decals/PhoenixD2a folder, delete the "D" folder and replace it with the new one. Next, open the FirstEagles/Objects/Aircraft/PhoenixD2a/Texture1 folder. Delete the file named "Decals.ini" and move the new Decals.ini and Numbers.lst into the folder. Do not delete any other files from the Texture1 folder.